Relishing our mild wet winter (so far – I have probably spoken too soon!) 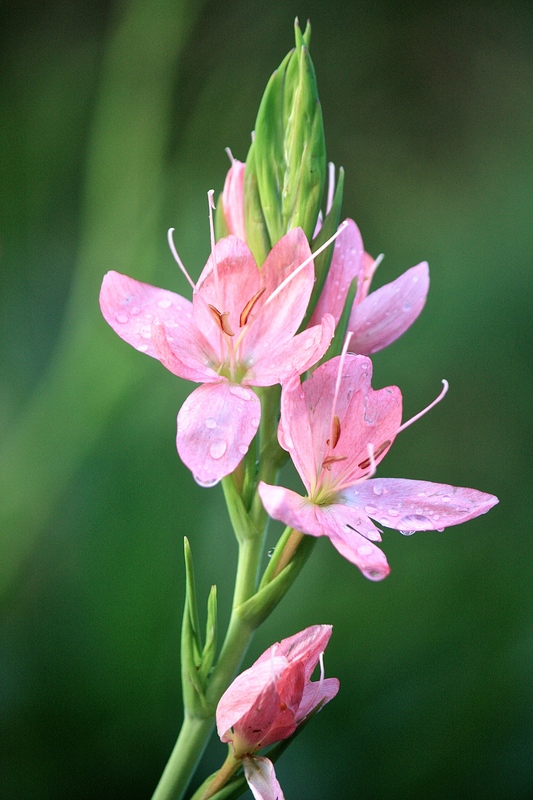 is the South African flower Schizostylis coccinea or Hesperantha coccinea. Both names sound more like a form of food poisoning than a pretty perennial, so let’s call it by its common name, the Kaffir Lily. I spotted this spike of pink flowers beneath gloomy skies on Boxing Day, bringing cheer to an otherwise dreary day. As you can see the flowers withstand rain nicely, but positively glow in the smallest amount of sunshine. Given moisture and a little time to bulk up, this is a plant that will reward from October until the first severe frost, occupying a gap that many gardeners find difficult to fill. My grandmother grew it well on thin stony soil on the North Cornwall coast, so the Kaffir Lily is neither too precious nor too delicate for exposed positions.